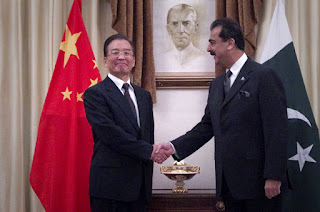 When China’s prime minister opened the gleaming white latticed China-Pakistan friendship centre in Islamabad at the weekend, the gesture of friendship might easily have been mistaken for naked ambition. Pakistan is the latest country where Beijing is deploying economic power for diplomatic ends. Last month, China agreed $20bn worth of deals with France and is considering the possible purchase of Portuguese government bonds. The three-day visit by Mr Wen to Pakistan was a crowning moment in a 40-year partnership underpinned by military hardware and increasingly infrastructure development. Beijing is warmly described as “an all weather friend” by top Pakistani officials – a description that differentiates it from Washington, viewed as one of the more fair weather variety. Islamabad plays the two powers off against each another to get what it wants at lower cost and with less fuss.